Are you planning to spend time celebrating Advent with your family this year? If so, it’s best to capitalize on the ‘countdown nature’ of Advent and help your children become familiar with what Advent is daily. At Ministry Pass, we help pastors preach compelling sermon series and as we were preparing content to help them preach their Advent sermon series, we stumbled upon several great ways for families to celebrate Advent at home and take what happens during weekend services further than 60 minutes per week. Feel free to use these ideas and modify them to best fit your family. The significance of Advent is foreign to many – and your pastors will help bring greater context for the tradition through their sermons – however, the concept of an Advent calendar is very familiar. A quick search on Amazon for Advent calendars will give you dozens – maybe even hundreds – of variations, themes, and types. People love a good countdown and retailers know this. Mainstream retailers know the power of Advent is real or else they would not stock their shelves with products that recognize the tradition. Countdowns to Christmas are already happening and families would do well to inject spiritual awareness into those countdowns through the season of Advent – bringing greater context to the Christmas season for children and other family members. As you prep your Christmas celebrations, consider making it a point to purchase an Advent calendar to use at home. Perhaps you could even pick a calendar on Amazon or a local retailer and encourage other friends and family members to get that calendar so everyone can go through the same thing at the same time. Whatever calendar you choose, it will be effective because the power of a countdown is the anticipation – and that is the crux of Advent! For example, if you use an Advent calendar that has a piece of chocolate hiding behind each door, the feeling of anticipation for you and your family could look something like this. What kind of chocolate will I be getting today? Will it be bigger than yesterday’s chocolate? Anticipation is a very powerful tool to have in your family leader toolbox and genuinely creating anticipation for everyone in your family is very difficult to do, however, Advent makes it easy and ties right in with Christmas. Creating anticipation doesn’t get much easier than utilizing a countdown to Christmas. ‘National Lampoon’s Christmas Vacation’ is a prime example of how countdowns play a central role in Christmas. Advent countdowns provide a more guided approach to Christmas. Advent offers a great alternative to the consumer than the approach that is so prevalent. As valuable as weekly Advent sermons at church are, we ultimately want to see families emphasizing discipleship in their own home. Bible reading plans help readers know where to go and what to do when it comes to engaging with scripture. Opening up the Bible and just reading is a bit intimidating when you haven’t developed a discipline of reading scripture. An Advent Bible reading plan takes the guesswork out of what to read and is a suggestion your entire family will appreciate. In January, copies of The One Year Bible will spike in sales and many folks will spend the next year reading through the entire Bible for the first time. Leading your family through a smaller, more bite-sized Bible reading plan can help build momentum and confidence in spouses and children prior to an invitation in January to read the entire Bible. At Ministry Pass, through our research on Advent, we were #surprised #notsurprised to find that YouVersion has curated several stellar Bible reading plans specifically for Advent. You can find a reading plan as short as four days or as long as four weeks. YouVersion has created and curated Advent Bible reading plans that encourage spiritual discipline in bite-sized amounts. Great for preparing for a one-year Bible reading plan in January. The countdown calendar plus the spiritual discipline of a Bible reading plan is a powerful combination. You could choose to include one or the other, but don’t forget about combining them into a single daily practice to observe with your family. Whatever you do, do what works best for your family. Don’t feel pressured to create an extravagant nightly reading, prayer, and calendar ceremony. If the thought of combining multiple practices is intimidating or feels like a bit much, choose one way to celebrate: An Advent calendar, Advent Bible reading plan, Advent prayer, or something else that fits. The ultimate value you are trying to promote by celebrating Advent at home is to build a greater context in your family’s hearts and heads for why Christmas matters and what it is all about. Another way to help your family participate in Advent during the week is to purchase or create a family Advent wreath. The Advent wreath should contain five candles – one for hope, one for peace, one for love, and one for joy. The fifth candle is the Christ candle. Churches usually light this candle on Christmas eve. Your family could light one candle together each weekend after church service, or you could light them nightly together. Add a new candle each week until Christmas Eve or Christmas Day when you add the fifth candle to celebrate the birth of Christ. If creating your own wreath is a bit too much to take on right now, and for many families any additional to-dos during December are just not in the cards, a kit can be ordered online or from a local Christian retailer. The reading plan could also be used here, as well. Rather than doing a nightly reading with a Christmas calendar, you could do a weekly reading on the night you light the new candle for the first time. Just as Advent calendars are fairly common and offer a level of familiarity, there are Advent movies a plenty. Christianity Today has created a liturgical calendar in the form of movies; you can use this list to select movies that emphasize the Christ birth story or the salvation offered through Christ. An alternative, if you prefer to not do movies, is to use the artwork from these movies to emphasize the themes you want to make your family aware of. 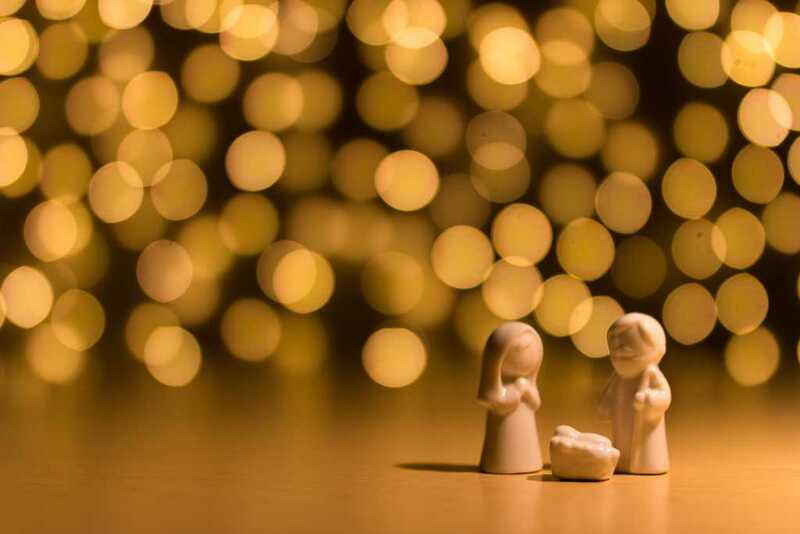 With all the hustle and bustle of the holiday season, there’s so much going on that we typically don’t stop to reflect on Jesus’ birth until Christmas Eve or Christmas morning. If you want to make this year the year that your family commits to reclaiming the story of Christmas, Advent provides the runway to make it happen naturally. Using practices like those shared above provides you with a game plan to celebrate Advent at your pace and slow down the Christmas season. Before you know it, December 25th will arrive and you will, once again, wish that you had been more intentional leading up to Christmas day. A daily or weekly reflection will create a stronger significance for Christmas day and allow you to touch on themes that you value in your home, beyond generosity and gift giving. Children will be counting down the days until they get to open presents. You can encourage them to count down the days until Jesus is born with the same level of anticipation. Using an Advent calendar, Advent Bible reading plan, Advent wreath, or Advent movies will help increase everyone’s understanding of what Christmas is all about and give you a countdown to remember that, just as God promised, Jesus is coming!